Your comprehensive source for practices, metrics, and trends driving law department operations. This year’s report demonstrates a focus on further enhancement and refinement of how law departments operate. Many best practices have been widely adopted, such as dedicated law department operations managers, e-billing and matter management systems, matter-level budgeting and preferred provider programs. Now law departments are embarking on new initiatives that target issues such as client engagement, process improvement, information management, and company strategy, all while meeting the demands of a fast-changing legal environment. 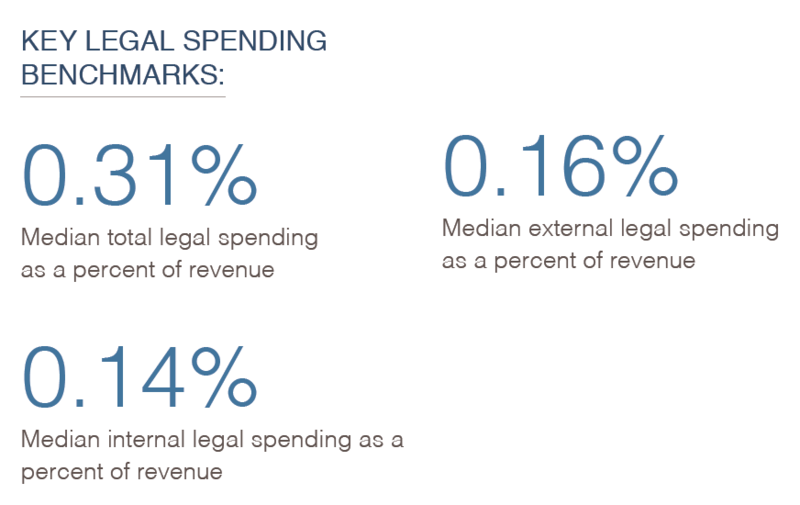 On average, law departments increased their spending, but at a lower rate than last year. 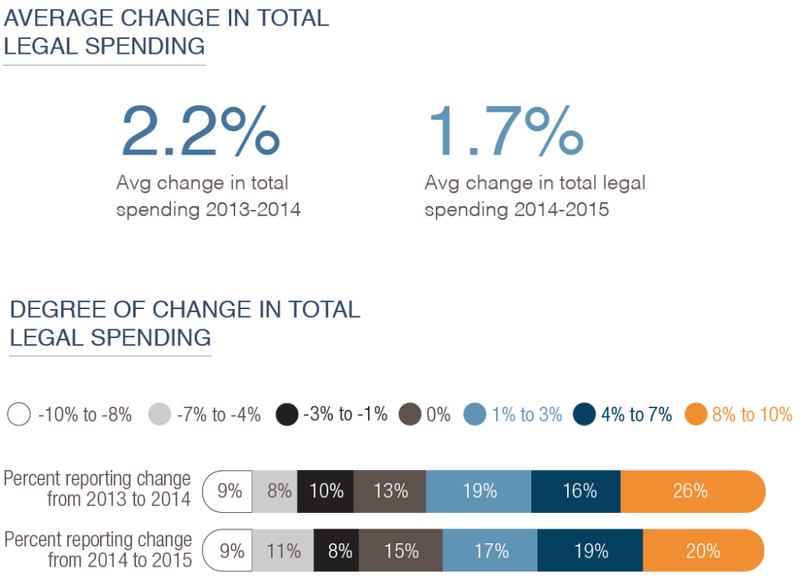 The average increase in legal spending from 2014 to 2015 was 1.7%, as compared to 2.2% from 2013 to 2014. While the majority of respondents reported an increase, 28% reported a decrease in legal spending. Although their rank varies depending on industry, four interrelated challenges lead the list for 2015 and 2016: increasing or changing regulatory requirements, internal resource constraints, industry economic pressures, and data/information security and privacy challenges. Many of the regulatory issues companies currently face relate to data privacy and cybersecurity concerns, and industry economic pressures certainly influence law departments’ available internal resources. A number of law departments’ planned initiatives relate to these challenges. The most commonly identified initiatives reflect an overall emphasis on strategic and disciplined management of spending, client satisfaction and performance measurement, proactive information governance, and tools to manage the flow of information, such as document and contract management systems. Companies are recognizing the importance of information governance programs to leverage information’s value and reduce risk. Enterprise-wide information governance programs are in place (34%) or planned (38%) at most respondents’ companies. Reflecting the perceived importance of data and information security and privacy as a challenge, the majority of responding companies reported they have an enterprise cybersecurity and/or data privacy program. Many who lack a program plan to implement one soon, especially larger companies. But law departments are not so systematic in protecting their data outside company walls: only 21% percent of responding law departments currently have a third-party information risk assessment program, indicating an opportunity to better ensure the protection of company data in the hands of law firms and other service providers. New discovery management survey questions reveal additional areas where law departments have opportunities to further refine their operations. Discovery management programs are fairly common at the largest companies, but relatively few companies with revenue under $10 billion have them, even though for companies with any volume of litigation those programs can reduce risk by improving consistency and defensibility and save money by limiting the need to “reinvent the wheel” with each new case. Responding to numerous studies about the value of diversity in the legal profession, law departments are beginning to seize the opportunity to make a difference by using their spending leverage to promote their providers’ diversity. 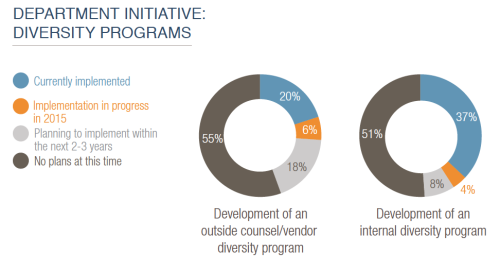 While nearly half of reporting law departments have or plan to have internal diversity programs, only 20% currently have programs to promote diversity in their outside counsel and vendors. Over the next several years, an additional 24% of responding departments plan to implement diversity programs with their external providers. L aw departments continue to become more sophisticated in their management of spending, with 67% of respondents using matter-level budgets and 74% having, or planning to implement, structured programs for conducting rate negotiations. They are also better managing their outside counsel, which has a direct impact on spending. The majority of responding law departments (57%) have preferred provider programs for outside counsel and use a relatively small number of firms (a median of 8 across all respondents) for 80% of their work. Many are also making internal efforts, such as looking to increase the number of lower-cost resources such as paralegals and junior attorneys to build the department’s support structure. At the same time, law departments are focusing on value. Internally, the majority track metrics and department performance indicators. 43% percent conduct internal business client satisfaction surveys and more have plans to do so. Externally, law departments still have the opportunity to improve how they systematically measure value: only 21% of respondents have a formalized outside counsel review process, although many, especially in larger companies, plan to implement one in the next few years. Most respondents use some form of alternative fee arrangement—a value-based model when well implemented. For more information about the complete report, please contact Robin Snasdell (rsnasdell@consilio.com or 713‑939‑4505).